And you thought you spent a lot of money on Pet Society. 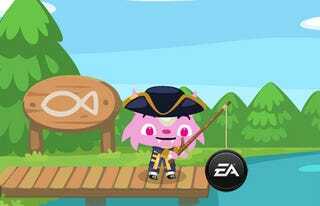 EA just spent $300 million on leading social network game creator Playfish, the team behind Pet Society, Restaurant City, and Country Story. With more than 60 million active player across all of its Facebook, MySpace, Google, and iPhone games every month, social network game developer Playfish was ripe for the picking. Now they've been picked. As rumored previously, EA has acquired the company for $275 million in cash and $25 million in equity retention agreements, with up to an additional $100 million in variable cash consideration, pending the achievement of certain performance milestones through December 31st of 2011. Did EA Just Drop $250M On Social Gaming Dev Playfish? Playfish will now operate as a part of EA Interactive, a division of the company dedicated to web and wireless games. More than 150 million Playfish titles are installed and played around the world, with titles like Pet Society, of which I am a big fan, generating more than 1 billion play sessions a month. "Social gaming, with its emphasis on friends and community, is seeing tremendous growth and this is the right time to invest to strengthen our participation in this space," said Barry Cottle, Senior Vice President and General Manager of EA Interactive. "EAi has been successfully leading the charge for EA, and with the addition of proven expertise from Playfish, their broad consumer base and strong game brands, we're moving ahead aggressively in our plans to lead in the category of cross-platform social entertainment." If there was any doubt that EA was completely serious about the social networking games space, this should get rid of it. This is an aggressive move into the growing industry segment that could only be topped by the acquisition of Mafia Wars creators Zynga, which I am fully expecting some major game company to announce any day now.